PPC is a form of advertising within the search engine results page (SERP). When you type in a keyword phrase in the search box of Google and hit enter, you get a list of results, the SERP. There are usually ten organic results and also usually ten paid advertising results. 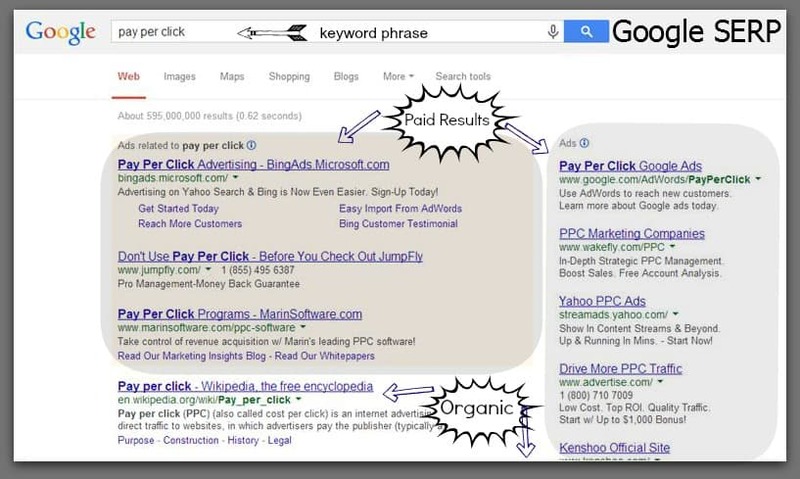 The paid results are usually indicated by the terms ‘sponsored ads’, ‘ads’ or ‘ads related to your keyword’. They are located at the top of the results, usually three, and then along the right side and sometimes at the bottom of the page and maybe intermingled within the ten organic results. Sometimes they even have a colored box around the top or bottom paid ads. 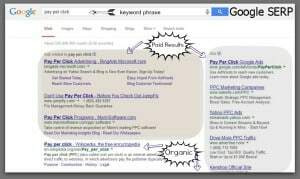 So, what’s the difference between organic and paid results? Organic results don’t cost anything in order for them to show up within the search results. However, you do need to be savvy about search engine optimization (seo) in order to aid your website in being found within the top pages of the results. You can find out more about organic results under the SEO tab on our website, but you should know that it is a free listing on search engines. Basically, those search engines, such as Google use the content on your site as well as your total footprint on the internet to determine what results show up in the organic results. How can paid ads help my business? Paid ads are guaranteed to do one thing, get more traffic to your website. It can’t guarantee that the user will purchase your product or services though. However, if you create your keywords, negative keywords, ads, ad groups, geographical data and budget strategy well, your chances of obtaining more viable users are greater. For example, if you repair cars, be sure the ad is clear that you repair ads and that the keywords drive traffic for the repair of cars and not for the purchase of cars. You can optimize your paid campaigns by putting negative keywords so you be sure your ads aren’t coming up for terms like buying cars, using our example. You also have to consider that when consumers are searching terms in the search engine they are looking to buy or obtain services, doing research for school maybe or gaining knowledge prior to obtaining services. This is completely different from someone being randomly solicited for a product they aren’t looking to buy, like a telemarketer calling to sell you a credit card. You weren’t looking for a credit card at that time. However, when looking online, you actively entered the terms for a product or service you were interested in. It is more like a warm lead. So, with that being said, make sure the landing pages are optimized, that the paid ad campaign is mapped out for the specific target, i.e. repairing cars and you will get traffic to your site. Now, the catch is to give them the information they are seeking and keep them on your website so they will either return to buy or return for further information to later buy. We hope this has helped explain paid advertising better. Please contact us if you have any questions about this service or if you are need of help with a current or new PPC campaign for your small business.